Hong Kong, January 7, 2016 – QIMA, a leading global quality control and compliance service provider that partners with brands, retailers and importers around the world to secure, manage and optimize their supply chain, today announces its 2015 Q4 Barometer, a quarterly synopsis on outsourced manufacturing and the quality control services industry. 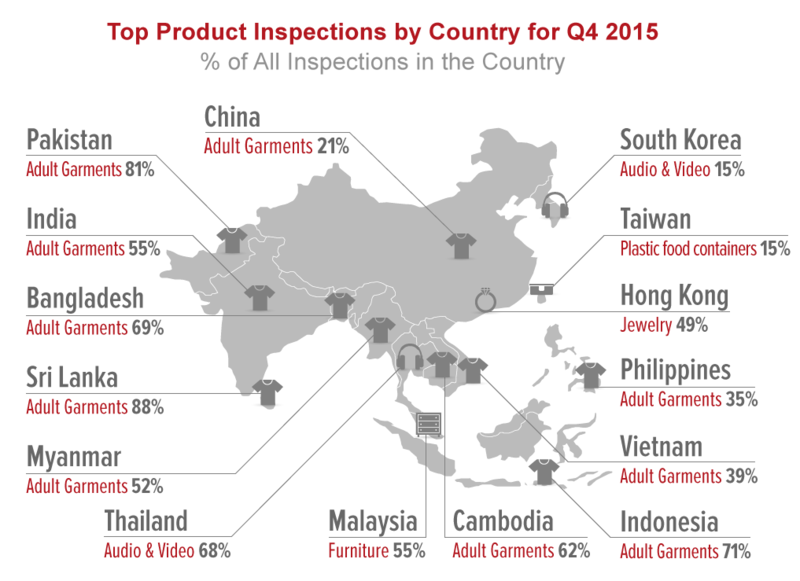 QIMA data indeed shows that through all of 2015, nearly one in three product inspections performed in Chinese factories have failed for exceeding the allowed level of defects. Meanwhile, as other Asian rising stars develop into export powerhouses in the wake of lower manufacturing costs, quality issues are on the rise. Inspection failure rates in 2015 saw a booming +13% in Pakistan, +11% in Thailand, +9% in Vietnam, and +4% in Cambodia. Even the more mature India saw a +3% increase in failure rates. As buyers turn to new sourcing regions for cheaper alternatives to China, 2015 has brought to light how less mature export economies are often plagued with ethical supply chain issues. QIMA data on Factory Auditing scores (based on ethical, structural, environmental and manufacturing factory audits) indeed shows no improvement year-on-year as scores remained flat globally in 2015. Again, less mature manufacturing economies were the low performers and saw factories compliance deteriorate, with Cambodia seeing its average factory score decrease by more than 2 points (out of 10) in Q4 2015 vs. 2014, and Pakistan, Indonesia, and Vietnam also seeing compliance drop. What to Expect in 2016 Global Sourcing? While the COP 21 summit held in France in early December has shown significant positive signs and willingness of governments to tackle global warming and incite environmental consciousness,6 the situation remained all too different in China. As QIMA has seen demand for Environmental Audit services pick up in 2015 from brands and retailers that wish to assess the impact of their supply chain, in the wake of such initiatives as Greenpeace Detox ® campaign or the Zero Discharge of Hazardous Chemicals (ZDHC) principles, one should expect to see environmental impact moving up the priority list 2016 for global sourcing executives. Global Trade: a New Start in 2016? As experts anticipate a global trade rebound, particularly in south-to-south exchanges,12 QIMA indeed has seen growth building up in the Southern Hemisphere through 2015, as product inspections volumes increased: including by 129% in Cambodia, 119% in Thailand, 114% in Peru, and 108% in Vietnam. QIMA (QIMA), a leading global quality control and compliance service provider that partners with brands, retailers and importers around the world to secure, manage and optimize their supply chain. With unique web-based quality control management, QIMA offers Product Inspection, Supplier Audit Programs and Laboratory Testing services for more than 4,000 clients worldwide. The 2016 Q1 Barometer is a quarterly synopsis on outsourced manufacturing and quality control services performed by QIMA each year (product inspections, supplier audit programs, and laboratory testing). 1. The Guardian. UK retailers recall hoverboards following government advice. December 16, 2015. 2. Retail Times. Stericycle Index reveals 60% of all EU consumer product recalls last quarter originated in China and Hong Kong. November 20, 2015. 3. The Guardian. Shrimp sold by global supermarkets is peeled by slave labourers in Thailand. Decemebr 14, 2015. 4. Todays Zaman. Turkey named among worst countries for workers. June 25, 2015. 5. Todays Zaman. 1,593 Turkish workers die on job in first 11 months of 2015. December 02, 2015. 6. The Huffington Post. Paris Agreement – A Good Foundation for Meaningful Progress. December 1, 2015. 7. Time. China Issues ‘Red Alert’ Over Devastating Air Pollution. December 19, 2015. 8. Reuters. RPT-More than 60 pct of China's underground water rated unfit for human contact. June 4, 2015. 9. Law 360. How China Now Enforces Its Environmental Protection Law. November 25, 2015. 10. Torontoist. Public Works: Real-Time Pollution Data Delivered to Your Smartphone. January 27, 2015. 12. Trade and Export Finance. Global Trade Set For Bumper 2016, Says HSBC. December 8, 2015. 13. Fibre2Fashion. 'TPP may boost Vietnam apparel export by 50% in 10 years.' December 7, 2015. 14. Vietnam News. Garment industry joins supply chains. December 19, 2015.